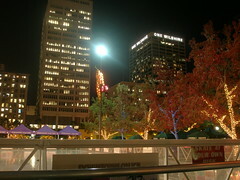 A last minute meetup occured last night at the ice rink in Pershing Square. It’s always great meeting new friends from the online world, but what made last night even better was that no one had any idea that the LA Parks Department offers this gem to Angelenos annually. In it’s 11th year, the LA Kings’ Downtown on Ice at Pershing Square is one of LA’s best community events. Under the twinkling skyscrapers and amid the bedecked trees, you can join in or watch your fellow Angelenos, hug the side wall of the ice rink, one hour at a time. You can see free concerts every day of the week, with Friday’s being the only evening events. There’s even a little food stand set up selling hot cocoa, clam chower and yummy BBQ tri-tip sandwiches. The Parks Dept. has made it really nice, with tables set up on 3 sides of the rink, but be aware that the only facilities are portable toilets near the corner of 5th & Hill. This weekend is the Winter Wonderland Festival, but even if you’re pressed for time with holiday parties, the rink will be open until January 19th. Admission fees are $6/per person, $2 for skate rental, there are family rates (4) people and discount for Metro users. See the website for more details. Is’nt there one of those new 25 cent self-cleaning restrooms on 5th and Hill?? I thought I saw one, but when we drove around, I didn’t. There were about 5 Port-a-Potties lashed together in the corner, though. Hahah. It makes me laugh to hear the Santa Monica rink is dinkier than the one at Pershing Square. While in line last Sunday, the massive family in front of me was complaining about why it wasn’t bigger and how come its not like the ones they’ve seen in the movies located in New York???? darleene, did you tell them, “Because we don’t live in New York OR the movies?” Yes, the Pershing Square rink is smaller than New York or even the awesome (and heated) rink in Kansas City, but considering it was 80 degrees the other day, I think any rink outside is wonderful. I know that my husband wishes he had a little more room to skate, as they let so many people on the ice at the same time. There is a quarter million dollar self cleaning toilet on 5th and Hill right by the Pershing Square Red Line Station, but other bathroom options are the public library or the Biltmore across the street. Just walk in, go up the stairs and go to your left and then to your right and then left again and there is the bathroom. You can also have drinks at the Gallery Bar, which will warm you up better than hot chocolate. I’ve found its pointless to point out to people that we don’t live in New York or the movies if they don’t already know. Heheh. Next PostNext Awesome? Or Abominable? My Neighbors Christmas Decorations….